This past week I attended Book Expo of America (BEA). 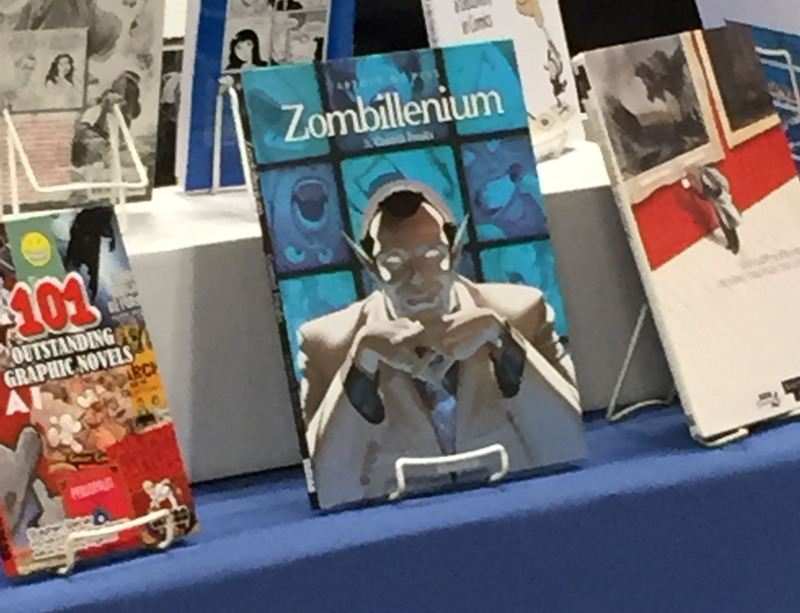 I was standing in line for something or another and I looked over and saw Zombillenium, Vol. 3: Control Freaks. (SQUEAL) The publisher did not have a gallery of it (BOO) but on my last day at BEA I decided that I would read it right there in the middle of the chaos of the Javits Center. No spoilers here but I love how Vol. 3: Control Freaks answered some linger questions from Vol 1. Gretchen and Vol 2. Human Resources. There is this delicate balance of answering just enough questions, while at the same time giving us new questions to ponder. de Pins excels at this like no other. This is easily my top favorite book of 2015. Zombillenium, Vol. 3: Control Freaks comes out August 1, 2015. If you haven’t already checked this series out, you really should. You will not be disappointed. Zombillenium, Vol. 4 won’t be out for a while because de Pins is working on the movie version of Zombillenium. (SQUEAL) There is a Zombillenium short , it doesn’t really do it justice but it does give you a little taste of the awesomeness. This entry was posted in Fantasy, Ghost, Graphic Novel, Magic, Monsters, Paranormal, Vampires, Werewolf, Witches, Young Adult and tagged Arthur de Pins, Graphic Novel, magic, monsters, paranormal, Vampires, Vol 3. Control Freaks, Witches, Zombillenium. Bookmark the permalink.